WARNING An error message saying that the kind of key is not applicable will be issued when attempting to install keys into a database that is not appropriate, e.g. programmer key into a compiled database. Online activation of keys takes place when a key is first installed on a new machine. 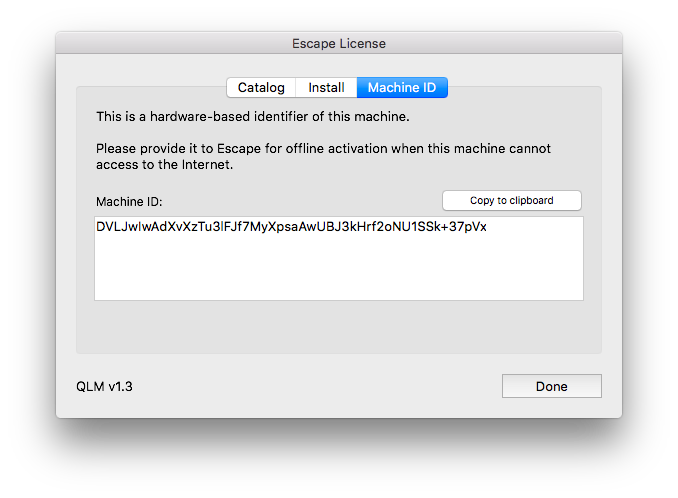 During activation, hardware identifiers of the machine are stored on Escape's activation server. User privacy is never put at risk in any stage of the activation procedure. Offline activation is necessary if the computer is not allowed to access the internet; in such a case, pre-activated keys must be used. To obtain pre-activated keys for any specific machine, take note of the Machine ID and pass it to Escape when ordering your keys. 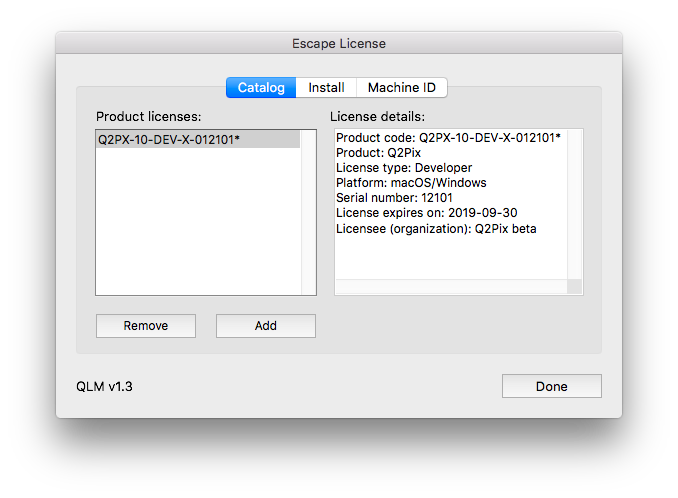 The ELM dialog lets review and modify all installed license keys of all Escape plug-ins, as well as obtain the computer's Machine ID (needed when ordering pre-activated license keys). • In single-user: keep down CapsLock and Shift when launching the database. 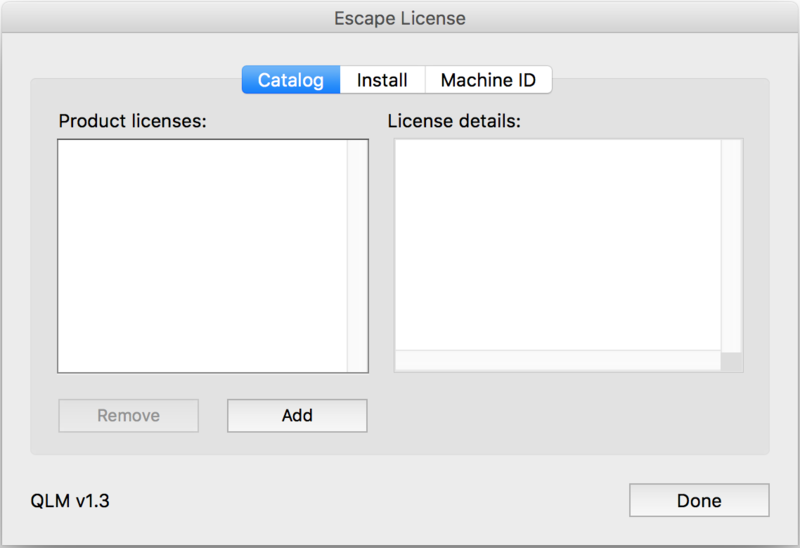 • In client/server: choose Escape Licenses in 4D Server's Help menu. Invoke the ELM and click the Add button on the Catalog page. Step 1 Carefully copy all lines of the license key from your delivery email and paste it into the entry area. Step 2 The key has been decoded and validated, and its details are now displayed. Make sure you are installing the right one. 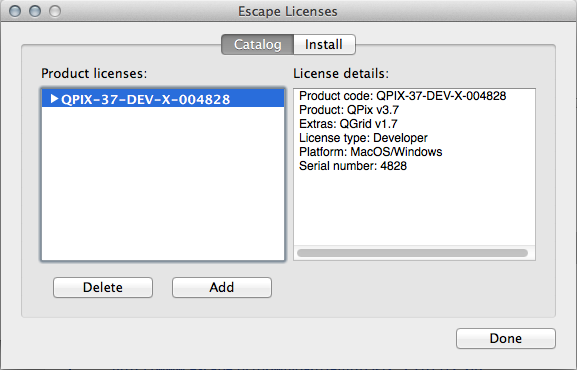 Step 3 The license key has been installed and you are seeing the Catalog tab of the dialog. Take note of your machine's Machine ID and send it to Escape when ordering pre-activated keys for this machine. 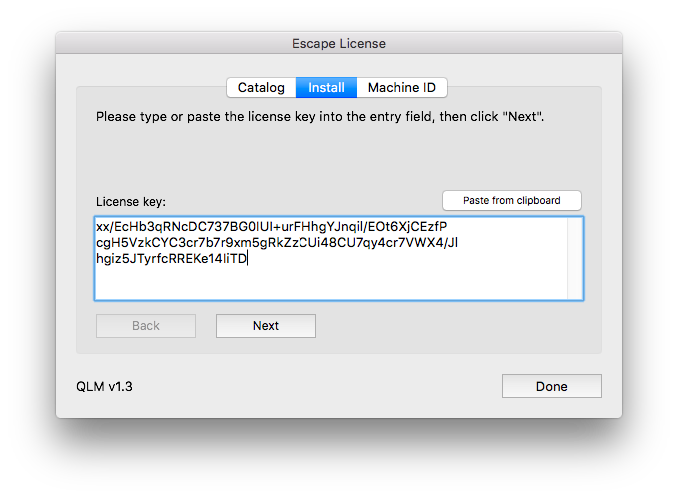 In client/server the administration of license keys is done exclusively from the ELM dialog, which can be invoked from the 4D Server's Help menu, item Escape Licenses. To start adding a key, click the Add button in the Catalog page of the dialog.